"The dog churn is in general use in many counties, particularly upon the borders of the Hudson. In Orange we hear this in operation in a summer morning at every farmhouse. It is a great saving of labor to the family, which has a barrel of milk to churn daily. In one place I saw a sheep treading the diagonal platform, and another tied at hand to relieve him." “The demand for a better grade of butter has called attention to the fact that the quality of the article depends very much upon the churn in which it is made. It is now conceded that floats and paddles inside a churn box are sure to injure the grain of the butter, the cream being whipped and beaten by them until the firm texture of the butter is destroyed, while by a swing or revolving churn this is obviated, the particles of the moving mass of cream coming in contact with each other and the sides of the churn only. The swing churn has a glass indicator in the cover, thus enabling a person to ascertain when the butter comes without raising the lid. DAVIS SWING CHURN This churn belongs to the class known as Oscillating Churns, and is very simple in construction." 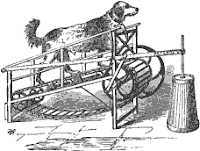 the platform is supported at each end, and at proper intervals along the whole length, with drums or pulleys; the motion of the endless platform giving action to the forward drum, through it to a crank upon one end, and to a balance-wheel on the other, producing the necessary motion and steadiness required to operate the ordinary dash churn. 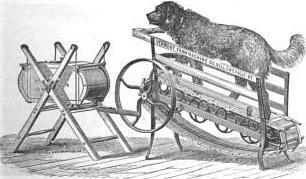 A sheep is found fully equal to a dog; the work is not hard upon either, and a dog of 30 pounds weight, or more, is found sufficient to do all the churning for a large dairy. Machines warranted to work as described, etc." "What is the cheapest, most durable, and most efficient power for churning? is a question that should claim the attention of every dairyman. 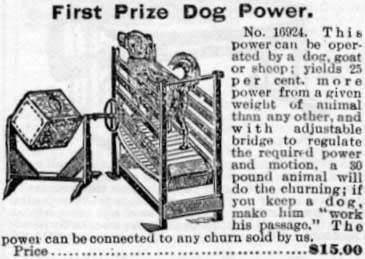 The hand power, dog, sheep, and water powers, are those usually employed for churning. Which is to be preferred, is the question. The dearest of these named, is the hand power. No one milking three cows, can afford to churn by hand. The tax of time and patience to do up the churning at all times when it should be done, is sufficient to prevent many from entering into the business; and reasonable men will not require the women to do the churning. A water power answers a very good purpose for those situated so as to employ it, but is expensive to establish and keep in repair, owing to the liability to decay. One objection to this power is its expense, and a second is its inefficiency in dry seasons. Those relying on this power are obliged to consent to churn by hand about one-fourth of the time. A dog power answers a good purpose, but the expense of keeping a great dog is about equal to keeping a hog the same length of time, and ninetenths of the dogs of the country are a decided detriment to their owners, and a scourge to all of the neighbors living within range of their nightly perambulations. When used to save steps they are about as apt to make ten as save one, besides the damage done to stock by being chased by them. Churning is about as good use as a dog can be put to. Unquestionably a power propelled by sheep is much the cheapest, and most efficient of any of those in use. A sheep will churn two or three times a day, even in warm weather, without inconvenience; is much less expensive to keep than a dog, as its food is mostly grass ; and it will produce more wool than the ordinary sheep of the flock. Select those of the coarse wool variety, as they will stand the heat well, and are inclined to be mild in disposition. They soon learn to drink buttermilk and grow large and fleshy. Procure a chain fifteen or twenty feet long to fasten them; change their place to feed every day; and when the churning is over in the fall, let them go with the flock, and they are no more trouble until wanted in the spring. A sheep will churn the butter from twenty cows. If more cows are milked it might be necessary to have two sheep. How long they will live I am not able to say, but was acquainted with one that was used in a dairy of from twelve to fifteen cows until he was eighteen years old, and then he was butchered; a second that was used until he was seventeen years old; and a third that has churned from two to three thousand lbs. of butter yearly, and is now thirteen years old, and has every appearance of doing good service for years to come."